I got this in one of my many recent Sephora purchases. I was seriously considering purchasing either a clarisonic or a foreo Luna during the 20% off sale and was doing some research trying to make up my mind about which I wanted (but shouldn't purchase) and I came across this cool little contraption. Excuse the cat in the background. He always feels the need to be in these pictures lol. 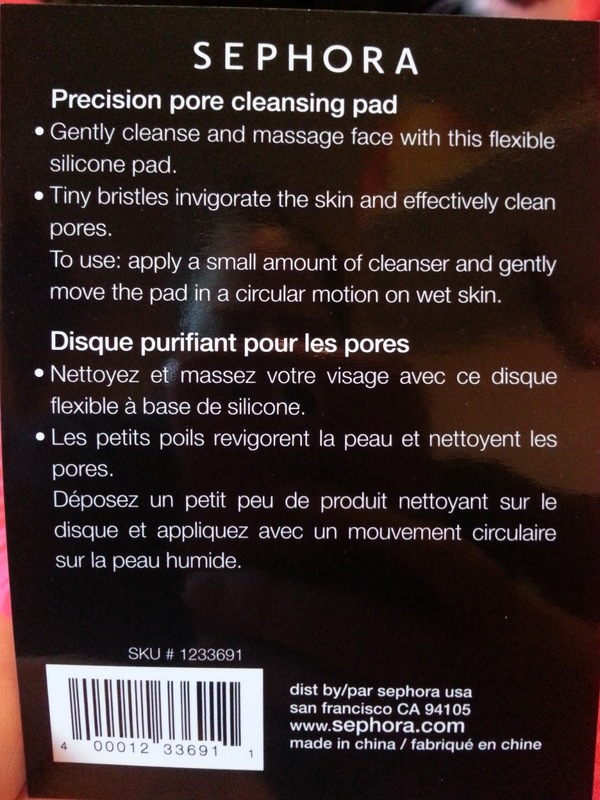 So this is a "Precision Pore Cleansing Pad" - apparently it's less abrasive than the Clarisonic, and while the Foreo is also not abrasive... this is much much cheaper. I think it was like $8... maybe a little overpriced for what is like a piece of flimsy plasticy rubber? I dunno... I figured if it didn't work then I could use it to wash my brushes as well. So basically the instructions say that you can gently cleanse and massage your face with this. AH SILICONE! That's the word I was looking for above! 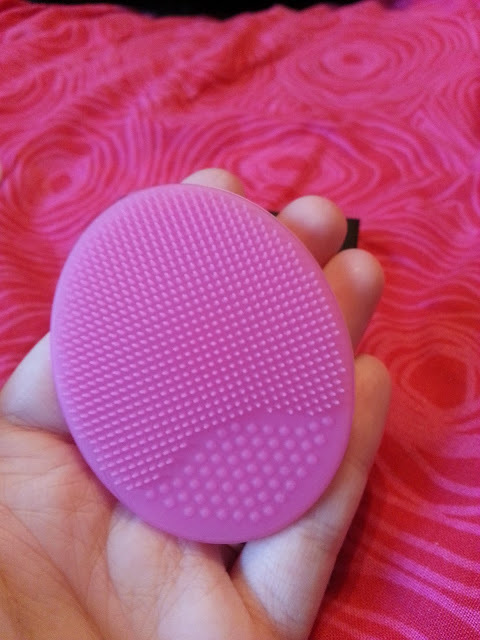 Anyway - the little bristles are so soft and they gently exfoliate your skin as you use it. What I do is apply my cream cleanser to my face first and then dampen the pad and then move it in circular motions on my face. As you can see, it's pretty tiny, as it's smaller than my hand (and I have child size hands lol) but it's not uncomfortable to hold. It could be a little bigger, but I guess that would make it a little more difficult when trying to use around your nose. What's also cool is that it has that suction cup on the back. I've tried sticking it up in my shower though and it won't stay. I also tried sticking it to my sink to try washing my brushes and it didn't hold very well there either. So a fail for me on the suction cup part. BUT it does help to hold onto it while cleansing your face. I've found that it is just soft enough to give a little bit of exfoliation. I was getting a lot of breakouts for a period of time and I thought maybe using some sort of device would help clear them up and have them happen a lot less frequently. 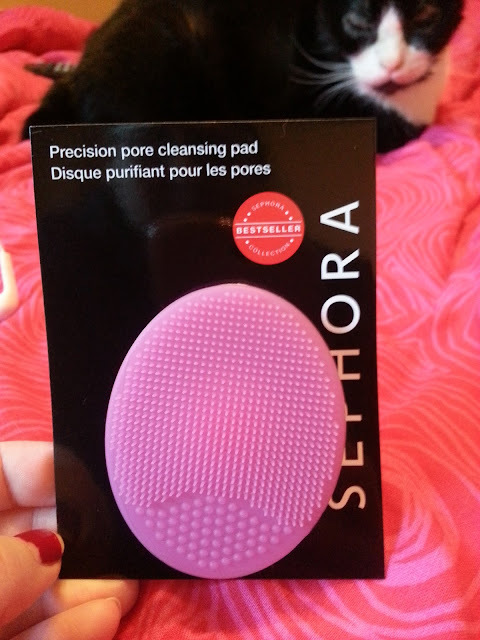 Again, I was really really tempted to try the Luna (more than the Clarisonic because I think that would just be way too rough for my sensitive skin) and then I decided to try this instead. I got a little exfoliation happy and used it everyday for about 4 days and my skin went NUTS. It looked so scaly, and it just hurt like I got windburn. So I figured out that I can't use this everyday like some people - which I should have known just because my skin has a mind of its own. I've changed to using it only once or twice a week, and I really like it. I find it is a lot more gentle then using an actual scrub on my face. And I like that I can use any cleanser I'd like with it. My only complaint is that I wish it was a tiny bit bigger, but I can understand why it's not. Would I purchase this again? Possibly. If I could find it cheaper elsewhere. But I can see that it will probably last a while. Oh - I also tested it when I was washing my brushes, and I couldn't tell if it really helped or not. So brush wise, not a big deal. Gentle exfoliation wise - I like it! AND! I need to add. I'm not sure if I took a picture of this, but I ordered a Shiseido night cream from Sephora probably about a month ago now.. and I swear it's ALMOST the same as my holy grail Shiseido cream. I'm so happy I finally found it, BUT it's more expensive than my original. Which is a bummer. I'll get a review up soon!